About 240 military couples gathered April 1-3 in West Virginia for the 2016 Operation Heal Our Patriots Reunion. The event was open to all husbands and wives who have traveled to Alaska since 2012 for the project’s Bible-based marriage enrichment training. On Saturday night, retired Army Lieutenant General William “Jerry” Boykin spoke to the couples. After a distinguished 36-year military career—more than 24 years in Joint Special Operations—Boykin now serves as the Executive Vice President of the Family Research Council in Washington, D.C.
Boykin commended the veterans for their courage—demonstrated already through brave military service—and emphasized their continuing obligation to their country. 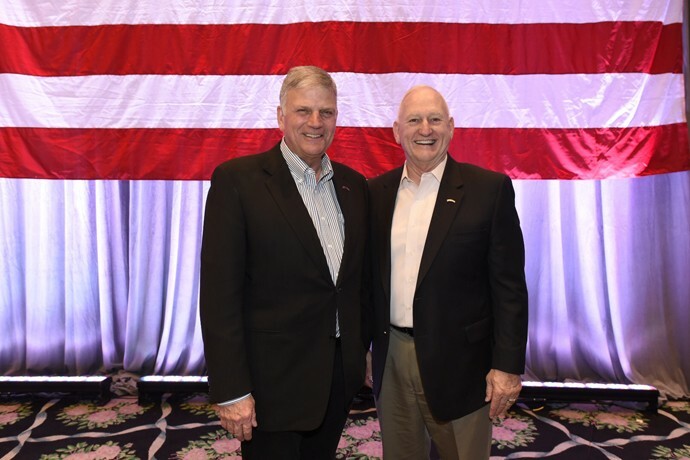 Two men of moral courage—Samaritan’s Purse President Franklin Graham and retired Army Lieutenant General Jerry Boykin—challenged military couples to stand up for truth. “Today the kind of courage that we need is moral courage. We need people who will stand up against evil,” he continued. Boykin concluded by calling on Operation Heal Our Patriots couples to parent well, serve their church, and get involved in their communities by running for city council/school board or by coaching youth athletic teams. Couples sing the national anthem at our 2016 Operation Heal Our Patriots Reunion. Army veteran Michael Simon is in the foreground. “I’ve been going to all 50 states, to the capitals, encouraging people to take a stand and let’s take this country back,” Graham said. “It can happen. It just takes people who are willing to take that stand and say I’m going to get involved and I’m going to fight. 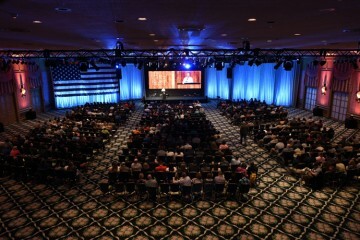 Graham first addressed the military couples on Friday night after leading prayer rallies and preaching the Gospel in Utah, Nevada, and California from March 29-31 as part of his Decision America tour. Graham then later read from Daniel 5—the story of the handwriting on the wall and the fall of King Belshazzar—and preached the message of salvation in Jesus Christ by grace through faith. Just as the king was guilty of sin and fell under God’s death sentence, all people are sinners and separated from God, he said. Couples worshipped together at the reunion. “A lot of you men have been involved in rescue missions. There’s no greater rescue mission than God sending His Son from heaven to this earth,” Graham said. “When He came, He came for one purpose and that was to take our sins. Jesus Christ took [our] sins to the Cross. “Ladies and gentleman, I want you to know God loves you. If you don’t remember anything else from this weekend, you remember this: God loves you. And God is eager and willing to forgive sin,” he said. Couples had a packed schedule over the weekend. 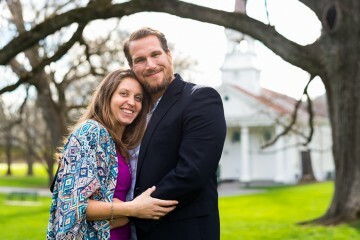 They heard from relationship experts Michael and Amy Smalley, cofounders of the Smalley Institute, in two large group sessions. With a refreshing mix of both lightheartedness and passionate concern, the Smalleys discussed the roots of marital conflict, its typical progression, and how to deal with difficult feelings in a better, godly way. Michael and Amy Smalley shared tools for handling marital conflict. “Fight in a way that your relationship wins, not where your selfishness wins,” Amy said. Romans 14:19, which reads, “So then let us pursue what makes for peace and for mutual upbuilding” (ESV), was a key verse for their message. “You want to have a good marriage. Don’t let Satan steal that from you. Connect. Love,” Amy said. Couples got a special treat Saturday afternoon as Greta Van Susteren, host of the interview program, “On the Record,” on the Fox News Channel (FNC), stopped by to visit for a little while. For the past three summers she and her husband John Coale have traveled to Alaska to spend time with our patriot couples, whom she said she now considers friends. 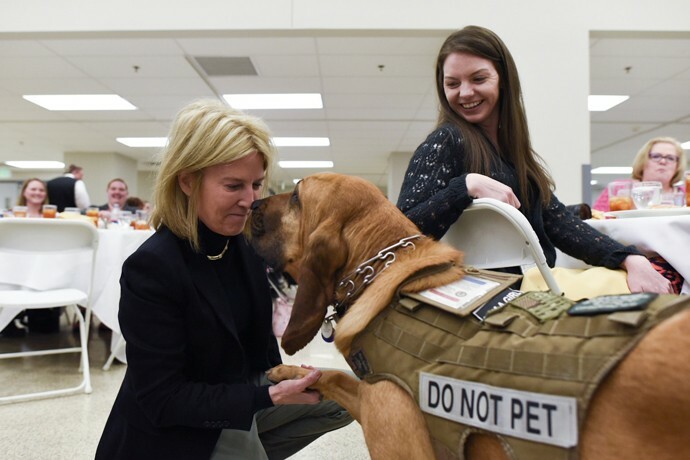 Danielle East watches as Greta Van Susteren shares a moment with Maggie, the service dog of Danielle’s husband Elton, an Army veteran. Almost 30 service dogs were present at the recent reunion. Also on Saturday, eight patriot couples rededicated their marriages to God and each other in a chaplain-led ceremony at a beautiful on-site chapel. Among them were retired Marine Sergeant Taylor Vogel and his wife LeShea of Sneads Ferry, North Carolina. A veteran of three combat tours—one in support of Operation Iraqi Freedom and two in support of Operation Enduring Freedom (Afghanistan)—Taylor wrestles with traumatic brain injury and post-traumatic stress disorder. In Alaska this past summer, he rededicated his life to Christ and was baptized. Though the couple came home from Alaska on a high, they hit rock bottom in their eight-year marriage not long after. They haven’t given up and things now seem to be slowly going in the right direction—the recommitment ceremony being one more positive step. 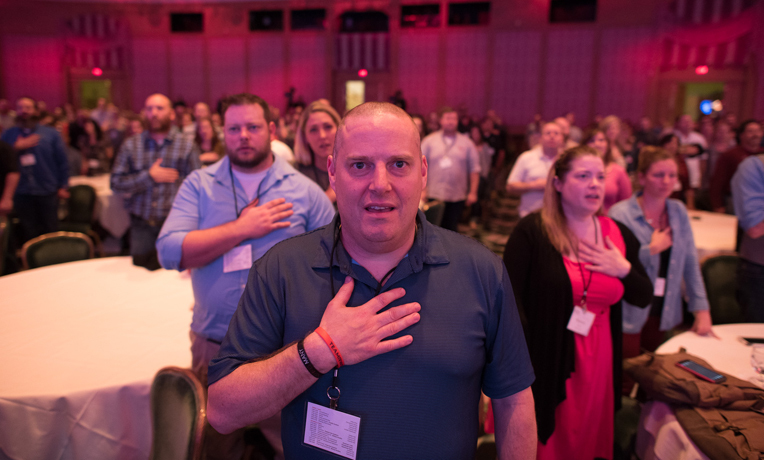 Eight patriot couples rededicated their marriages to God and each other during the reunion weekend. “If it wasn’t for the foundation and groundwork we got in Alaska, I’m not sure we would have made it,” Taylor said. LeShea gave a little history about why the ceremony at the reunion meant a lot to her. The couple was married at a courthouse and had their family ceremony in a vineyard. So, this opportunity seemed to better reflect where they want to be headed. “I feel like this was the right thing to do, here with Samaritan’s Purse in a chapel with godly people [around us],” she said. 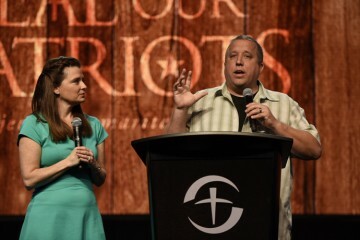 Retired Marine Taylor and LeShea Vogel rededicated their marriage under God during the reunion weekend. In addition to the solid training and teaching offered at the annual reunions, most couples look forward to them as a time to catch up with friends and bask in the feeling of family Operation Heal Our Patriots has built over the years. Retired Marine Brigadier General Jim Walker, the executive director of Operation Heal Our Patriots, closed the event by emphasizing the theme of aftercare and the commitment of staff to supporting couples over the long term. He said the adventure continues for each veteran and their spouse in terms of physical healing, relationship building, and spiritual growth. “We want to give you the tools to make those adventures better, more successful,” he said. • Three small group sessions addressed financial planning, faith and family, and parenting with post-traumatic stress disorder (PTSD). Those times were led, respectively, by retired Army Lieutenant General Robert VanAntwerp; our aftercare staff—Reverend Greg Duvall and his wife Shawna and Reverend Pat Fleming and his wife Karen; and Chaplain David and Dr. Suzanne Mikkelson. Reverend Greg Duvall and his wife Shawna (couple at left) and Reverend Pat Fleming and his wife Karen led a seminar on faith and family. • Musical worship and encouragement was offered by The Tommy Coomes Band and fast-picking guitarist Dennis Agajanian. • Participants enjoyed a video tribute to Jean-Claude Mille [1945-2015], the beloved chef of Operation Heal Our Patriots/Samaritan’s Purse, who went to be with the Lord last year. Every couple received a special cookbook featuring his recipes and photographs. 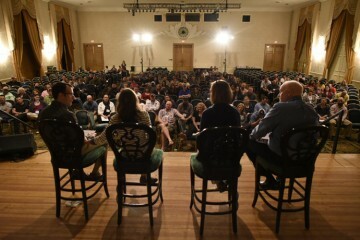 About 240 military couples gathered for the 2016 Operation Heal Our Patriots Reunion. • Eight Canadian military couples joined the U.S. couples this year at the reunion. For the first time in the project’s history, a total of 10 Canadian couples attended Week 16 of the 2015 summer season in Alaska. • Couples were given handmade quilts and prayer shawls from nine churches in the Appomattox, Virginia, region; thank-you letters from the children of The Bible Chapel in McMurray, Pennsylvania; and quilts made by Carolyn Clayton of Idaho. • Frank Mosley, a wounded Korean War veteran who turned 84 on April 1, greeted patriot couples as they arrived at the reunion site. He has worked at the hotel for almost six decades. 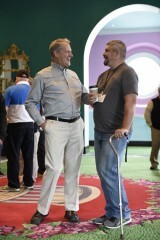 Chaplain Dan Stephens greets Army veteran Brien Costello at the reunion. 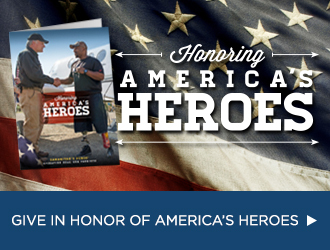 Samaritan’s Purse started the Operation Heal Our Patriots project in 2012 to strengthen the marriages of military personnel wounded in combat or combat-related activities after September 11, 2001. Couples, typically 10 at a time, are flown to Alaska for a week of marriage enrichment through the program. There, at our wilderness lodge, husbands and wives dig into a series of Bible-based marriage classes, listen to daily devotions, and are offered private spiritual counseling with our retired military chaplains. They also find physical refreshment by participating together in numerous outdoor activities, including kayaking, hiking, fishing, and wildlife viewing. Since 2012, Samaritan’s Purse has welcomed 526 couples into the project. 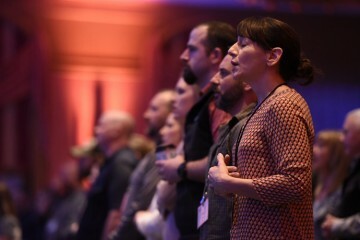 We praise God that more than 200 individuals have made commitments to Jesus Christ, and 227 couples have publicly rededicated their marriages to the Lord. Our ministry to these couples does not end in Alaska as we follow up with them over the long term through our aftercare program. Our staff engages them through regular personal contact (phone calls, emails, social media, visits) and encourages their involvement with a local church. Many of the couples also now support each other directly through networking and local gatherings. 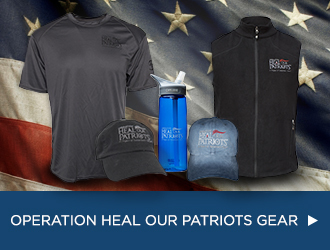 In addition, Operation Heal Our Patriots reunions and regional training events benefit couples by providing more Christian teaching and tools to enhance their marriage.